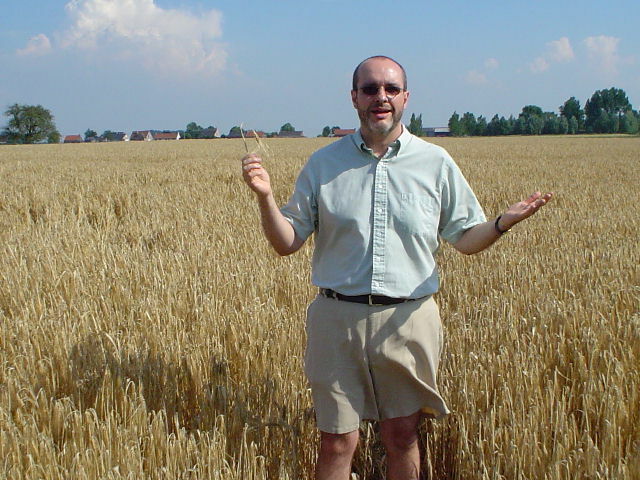 The author becomes lost in a wheat field. Experience the refreshing, yet complex character of these unique beers. For centuries Germany has been a country obsessed with clean, smooth, sweet lager beers that are produced with yeasts that provide almost no complexity because of fermentation carried out at cold temperatures. These beers (like most today) are made with malted barley. Somewhere near the middle of the twentieth century, an ancient style of beer made with wheat began to suddenly become popular again in Germany. This wheat beer was a cloudy, quirky, ale made with vivacious yeast that works best at warmer temperatures and produces complex fermentation flavors – not your typical German lager at all. Today, wheat beers hold almost one third of the total beer market share in Germany. Considering the fact that wheat is one of the oldest cultivated crops, it is not at all surprising that ancient beers contained this hearty grain. More “progressive” brewers in the 1700s promoted the idea that wheat is best as a food, and barley is better for making beer. When used to make beer, wheat gives more cereal-like grain flavors and has much more protein than barley. The grain flavors contribute to a wheat beer’s refreshing complexity, and the proteins produce a luminous haze in the finished beer. Hops are spicy flowers that are boiled in the beer to provide a bitter counterpart to the sweetness of the brew. Wheat beers usually have a very low hop component – allowing the flavors and aromas of the grain and special yeast strains to dominate. German and Belgian wheat beers use rustic yeast varieties that may contribute fascinating clove, spice, acid and fruit complexity to these beverages. In bottled versions some yeast sediment may remain at the bottom. A variety of styles of wheat beers are now produced by a multitude of breweries all over the world and have been discovered by a whole new generation of beer lovers. They are considered to be hip, stylish and one of the most refreshing and thirst-quenching of all beer styles – perfect for enjoying in spring and summer. All of the wheat beers discussed in this article are also somewhat low in alcohol (4-6% by volume), which further contributes to their reputation as “beer of choice” for the warmer months. Bavarian Weizens are the most popular wheat beers in the world. They exhibit aromas and flavors of clove, citrus, vanilla, bread, banana and even bubblegum. They pour with a thick, beautiful head of long-lasting white foam, and the high protein content can make the beer pleasantly cloudy. Their color ranges from golden to copper, and Weizens explode with invigorating flavors of grain; the bitter hops are rarely noticeable. A spicy, citrusy character from the yeast and high carbonation make these beers refreshing and somewhat dry. Darker versions, made with a portion of caramelized wheat and malt, are called Dunkelweizens and have the same complexity of the lighter Weizens with more caramel and dark toast notes. A Hefeweizen is an unfiltered version of the Bavarian Weizen that contains yeast settled at the bottom of the bottle or suspended in the keg. Weizens taste best when the yeast is mixed with the beer, so be sure to pour most of the liquid into a tall glass and then swirl the bottle to mix the yeast with the small amount of beer left in the bottle. Pour this into your glass, and the beer will take on a delicious, soft, bready character. Tilt your glass and pour a Weizen beer slowly, as most are highly carbonated and will produce a large head. You should choose a tall glass that is wider and somewhat rounded at the top -- this will provide room for foam and allow wonderful aromas to be released. Some of the best locally available examples of Weizens include Paulaner Hefeweizen, Schneider Weisse and Franziskaner Hefe-Weisse. American Wheat Beers are quite different from their Bavarian counterparts. These mild beers are usually yellow to gold in color and have aromas and flavors of wheat grains. The clove, spice and fruit character that is found in Bavarian Weizens are absent here, and the beer is light in body and quite similar to a light American Pale Ale with added wheat character. American Wheat Beers are intensely refreshing on a hot day, and are popular members of beer rosters in many brewpubs. For two of the best examples, seek out Harpoon UFO and Sierra Nevada Wheat. Belgian White Ale (or Witbier) is a 400 year old beer style that died out in the 1950s. Thankfully, Belgium’s Hoegaarden Brewery revived the beer, and this style has grown steadily in popularity over the past three decades. Belgian White Ales are very similar to Bavarian Weizens, but have milder, tarter flavors with additions of orange peel and coriander. These beers have a beautiful white foam and are very pale gold in color with a protein cloudiness from the wheat that makes the liquid seem to glow when held to the light. With a pleasant sweetness, orange fruitiness, coriander herbal quality and tart, dry finish, these are considered by many to be the most refreshing beers on the planet. Try a Belgian White with broiled shrimp, scallops, or lighter fish dishes in white wine, citrus, or butter sauces. Hoegaarden, Ommegang Witte and Blue Moon Belgian White are popular varieties. All wheat beers can be paired delightfully with summer foods. Bavarians even enjoy downing a Weizen with weekend brunch. The spicy, bready, low-alcohol beer goes well with the mild flavors of Eggs Benedict, hashbrowns and toast. Weizens are also delicious at picnics that feature hotdogs or bratwurst with spicy mustards and potato salad. Try a slice of tangy goat cheese with a sip of Belgian White Ale to experience a beautiful blend of tart flavors, and nothing is better with a summer green salad topped with an acidic dressing than a crisp wheat beer. Purists look down on the practice of sticking a wedge of fruit on a glass of wheat beer -- why cover the aesthetic qualities of a light, elegant and delicate beer with a slice of lemon or orange just to be cool and follow a trend? After all, you wouldn’t paint sunglasses on the Mona Lisa, would you? Make it a point to include these classic beers as a part of your spring and summer celebrations. You will see why refreshing wheat beers are making a world-wide comeback with modern consumers who long for lighter beers that actually have character and dimension!